In case you have not heard of the Fyre Festival: it was a planned music festival last year which never happened. They sold 1000s of tickets to 1000s of kids on Instagram who believed that they were buying into the dream ‘once in a lifetime’ holiday. Read about it here, or watch the documentary on Netflix. Effective difficult conversations that lead to progress CANNOT be left to the last minute. In this case, its no longer a difficult conversation, that is firefighting (sorry – the pun was too tempting). If you are working for someone who seems to have lost touch with reality, such as Billy McFarland, it is your job to challenge him (respectfully) months before the pending event. If you are afraid, or feel threatened to ask rational questions about realistic deadlines in a calm manner, you are in the wrong job. If your boss continues to not respond, and you know that the mission is impossible, then you need to consider your next move carefully. My advice: the team who knew something was wrong get together and come up with a plan B, giving the initial plan a clear deadline. It is too easy to blame the leader. Granted, the man seems to be a complete liar and thief, but all the best thieves need accomplices and people who will shut their eyes. 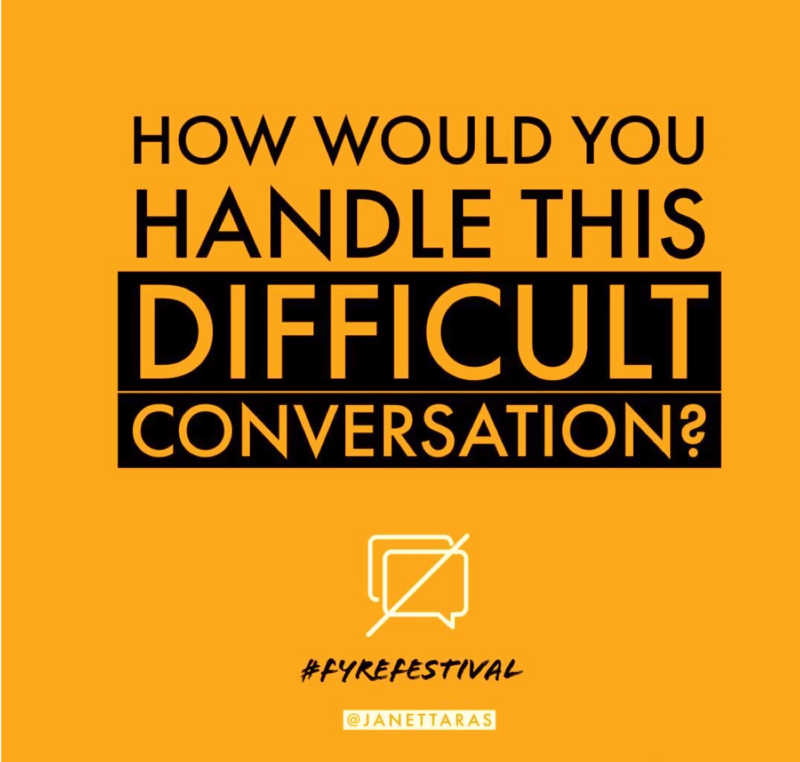 My difficult conversation advice : get your head out of the Exuma sand and become accountable for the actions of the entire Fyre festival team. Don’t just do what your boss tells you if it doesn’t make sense. Talk about all the ‘what ifs,’ create backups, notify shareholders and most importantly see how they could help each-other. It looked like every person was working in a silo and was being pushed off a cliff alone, especially that poor man who was about to ‘take one for the team’ just to get some water released from customs. Apparently, Billy McFarland did come out and speak to the disappointed attendees and managed to calm them down by promising their safe return and their money refunded. Not sure the refund actually happened but I can only guess that’s what stopped a mass violent riot. One final thought: You can’t expect to attend a great party on an island previously owned by Pablo Escobar – a dead drug lord who murdered 1000s and responsible for millions of drug addictions – without expecting a bit of chaos.